Have you hung out your bunting yet? Baked your Jubilee buns? Will you be bobbing along on the Thames like Mark & Stephen from Bloomsbury Flowers [www.bloomsburyflowers.co.uk]? Whatever you do, make sure it’s with flowers, the essential ingredient for a quintessentially British occasion. The lovely Fran Bailey of The Fresh Flower Company [www.freshflower.co.uk] has created a "Floral Flag fit for a Queen" using blue delphiniums, red sweet williams and white stock from New Covent Garden Flower Market. "Our floral flag is decorating the window of our studio, and we are raffling it off for charity, developing our marketing database at the same time. Some pubs and restaurants loved it so much that they commissioned their own from us!" 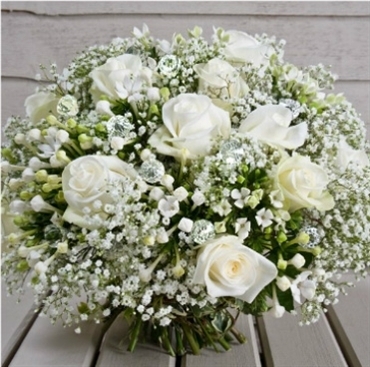 The Jubilee bouquet range from Paul Thomas [www.paulthomasflowers.co.uk] is unashamedly patriotic. The first is red, white and blue with Red Naomi roses, British blue agapanthus and white hydrangeas, dotted with crystals. Paul's 'Diamond Bouquet' is a vision of the pure white of Avalanche roses, gypsophilia and bouvardia studded with pretty crystals. Kristina Cousen of the Blacksmith's Daughter in Petersfield [www.theblacksmithsdaughter.co.uk] is selling Jubilee bouquets in-store. "Terry at Zest Flowers in the Market is always great for locally grown flowers. 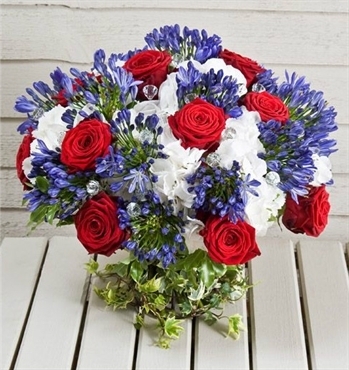 We are selling Jubilee bouquets in the classic red, white and blue, and they have got to be British, haven't they? So, I have been buying stocks, peonies, sweet Williams, cornflowers, larkspur, delphiniums and sweet peas." There are 14 traders selling British-grown flowers as part of their flower offer at New Covent Garden Flower Market, plus two British foliage sellers. But on one stand, British-grown flowers are a bit of passion: Pratley. Mick Waite of Pratley has specialised in locally grown produce for over a decade, well before it became fashionable and "on trend" to do so. As a result, his stand festooned all year round with Union Jack bunting, is a mecca for florists. "We are into the early summer season by the beginning of June," says Mick, before reeling off a list of just some of the beautiful summer flowers on his stand for the Jubilee. "Stocks, delphiniums, sweet Williams, cornflower, peonies, garden pinks, anenomes, alchemilla mollis, lilies, alstroemeria, lavender, alliums, astrantia, and perhaps some ranunculus and sweet peas." Whilst red, white and blue will rule the day in flower festivals across this weekend and on the Royal Barge this Sunday, the variety of British summer flowers is enough to whet a florist's creative appetite to celebrate Her Majesty's Diamond Jubilee! How are you celebrating the Jubilee with flowers?